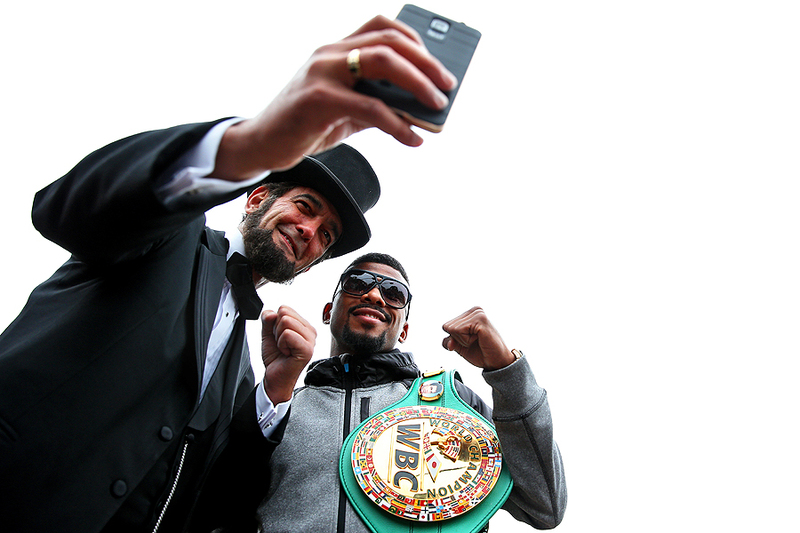 "Abraham Lincoln impersonator Ron Carley (left) takes a selfie picture with WBC Champion Badou Jack in front of the White House prior to Jack facing Lucian Bute (not pictured) in a super middleweight title fight, set for April 30, 2016 at the DC Armory, on April 27, 2016 in Washington, DC." Reactions from the general public often make the most of assignments where a majority of the day are posed portraits. A press tour helping promote a double-header headlined title fight had a group of photographers posing four professional boxers in front of iconic monuments in Washington, DC. These clean portraits helped place international boxers from the fight card in the district - and were great for clients worldwide. Yet it was another notable man that helped bring a candid moment to the otherwise set schedule day. That man was Abraham Lincoln, well, an impersonator of the famous president with the top hat. The best part was is that Abe sought out the selfie - making the moment even better.